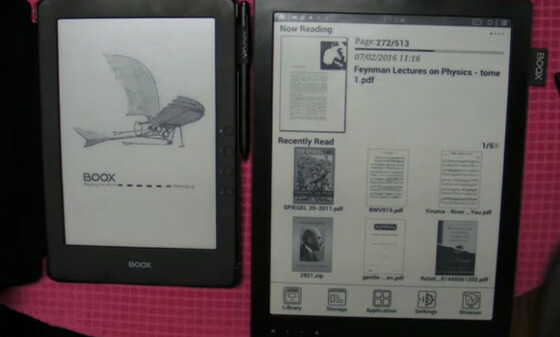 Booxtor from eReader-Store.de, one of Onyx International’s authorized resellers, has uploaded a YouTube video showing the new 13.3-inch Onyx Boox Max and Onyx Boox N96 (N96C and N96ML) E Ink ereaders in action. The video is insanely long and doesn’t include any narration or editing so I could only stand to watch it for about 2 minutes before getting bored, but at least it does show the two new devices in action. It’s amazing just how large the 13.3-inch Onyx Boox Max appears. It makes the 9.7-inch N96 look tiny by comparison. At the end of the video the N96 with frontlight is shown. It’s one of the first 9.7-inch E Ink ereaders to get a frontlight and it actually looks decent. Frontlights are notorious for uneven lighting and shadowy areas on small 6-inch screens so obviously larger screens are going to be even more difficult to get even lighting, but it looks pretty good for the few seconds it’s shown in video. Booxtor also revealed some interesting new details about the Onyx Boox Max at MobileRead. First off it’s going to be using the 1600 x 1200 resolution E Ink Mobius screen instead of the 2200 x 1650 screen that was promised earlier. Apparently the higher resolution screens have been delayed so it was either go with the same screens used on the Sony DPT-S1 or delay the Max to the point where it would likely never get released. Booxtor also gave a tentative retail price of 585 euros without VAT for the Onyx Boox Max, although that could change when it gets released in a couple of months. That is equivalent to about $650 USD, which is about $150 less than the current price of the only other 13.3-inch E Ink ereader, the Sony DPT-S1, but Booxtor’s price doesn’t include shipping from Germany. That looks really cool but it’s hard to trust any kind of reviews uploaded by the company that sells them. Are you going to be reviewing it? Sorry but I most likely won’t be reviewing either of these new Onyx ereaders. So far that German store is the only place I know of that plans on selling them, and it’s way too expensive to buy these just to review them. Twice I’ve asked Booxtor if he’d loan me a device to review and both times he said yes, but then both times after I emailed my address I never heard from him again, so I’m not even going to bother asking this time. Its weight is more or less like my M92 and seems much faster. I have noticed that there is no more joystick for the N96ML ereader. This means that you are doomed if you loose the stylus. How can you move within a page and how can you select any action? Am I right? If it’s something you’re worried about just get the dual touch model or an extra sylus. Wacom stylii are not that hard to replace. Just search eBay or Amazon. I also want this real bad. I had to return an M96 bought from Ebay coz the seller advertised as a “plus” when it turned out to be the 4 gb internal storage version. I think I want the front light version. Does the booxter store ship to the US? And how much would it probably cost me in US dollars? You’d have to check with them for a price. I know they ship pretty much anywhere but it ain’t cheap. It’s probably like $50 or something. The only problem with ordering things like this internationally is if there’s something wrong with it the buyer is responsible for return shipping, and for reasons I cannot understand it always costs way more to ship from the US than to the US, like twice as much at least. Yeah, I don’t know what’s up with that US store. It’s been around for years but it’s like nobody ever updates it to sell new products. I sent the US store an email a few hours ago so hopefully they’ll respond to me. Also called them store hours but got voicemail. The US store doesn’t really exist. I drove to the address listed in Atlanta today, at 200 Ottley Dr. The business is not there, and no one can seem to remember it ever being there. It’s just a building with some cheap warehouse space. Have you noticed? Here the N96 has backlight AND dual touch. But they only let you buy one with dual touch OR backlight! I broke my ONYX BOOX M96 and I really hope amazon makes bigger e-readers so we don’t have to pay so much to get such crappy products. oh by the way I bought from e-reader store and if you must buy onyx wait until a more trustworthy website sells them (original or amazon I guess). If you want to buy for them regardless: Don’t believe in the “extra specs” they make up.